This week, Access All Areas members are being treated to a new watercolour themed design resource courtesy of Katia from The Little Cloud. Go Floral! 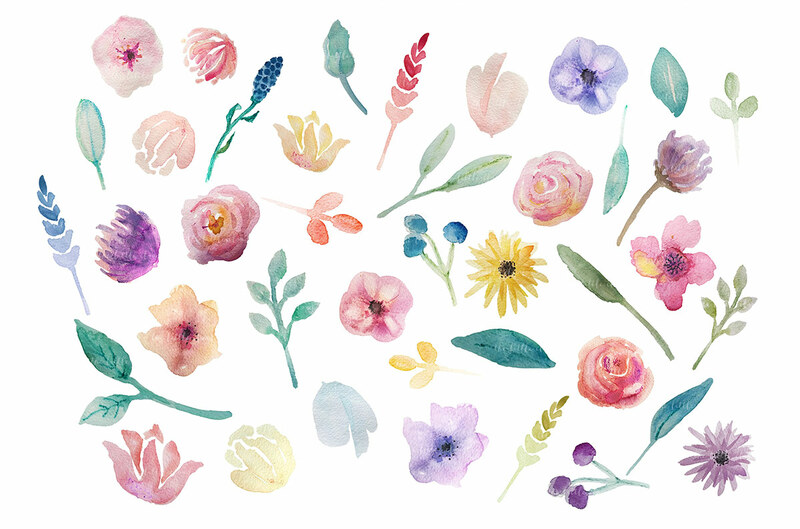 is a bundle of hand painted watercolour clip art, featuring 40 individual flowers and leaves, each 5-10″ big at 300dpi, along with 7 prearranged floral posies, 3 floral frames and a bonus wreath. Every graphic comes as a transparent PNG file, making them easy to use and compatible with all kinds of image editing software. The Little Cloud is the online store of Katia Volodina, a talented painter and illustrator who loves producing graphic design resources for creatives to use in their artworks. Her store is full of beautiful items, ranging from elegant backgrounds, quaint clip art sets, and colourful watercolour graphics. Katia’s latest product is a best-selling backgrounds bundle, including her most popular textures and patterns for just $17. This collection of hand painted watercolour clip art graphics is the latest premium resource for Access All Areas members to download. Create elegant artwork by decorating your designs with floral elements, posies, wreaths and frames. These are so beautiful and useful Chris. Thanks a lot. I love all of them, thanks Chris & Katia! They are so beautiful! Thank you for sharing all those with us. Hi Angela, if you are a Premium Member you would pay a monthly subscription and be able to access the extra resources. Thanks for sharing your nice illustrations.